In the summer of 1890 the Episcopal congregation in Lockerbie decided to provide themselves with a permanent centre for worship, and a resident clergyman. They acquired a building at Townhead, and altered it internally to suit their needs. 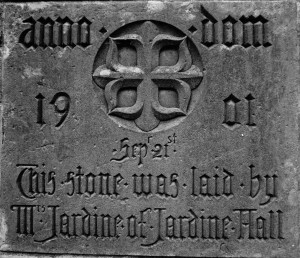 It was dedicated on November 1st 1891 (All Saints Day). However, after some years, the congregation decided to build a new church. Subscriptions were raised and the architect John Douglas of Chester was employed. 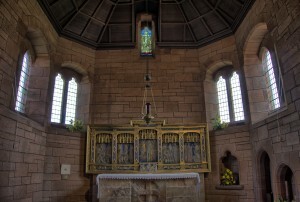 All Saints Lockerbie is the only church he built in Scotland. It was constructed of ashlar blocks of sandstone, from the nearby Corncockle Quarry, with a red tile roof and has a West tower with a broach spire. Craftsmen and tradesmen employed were builder William Lawson; joiners Messers Dryden; plumbers Messers Drummond and E. Moffat slater and plasterer. Building the church cost a little of £2,071. 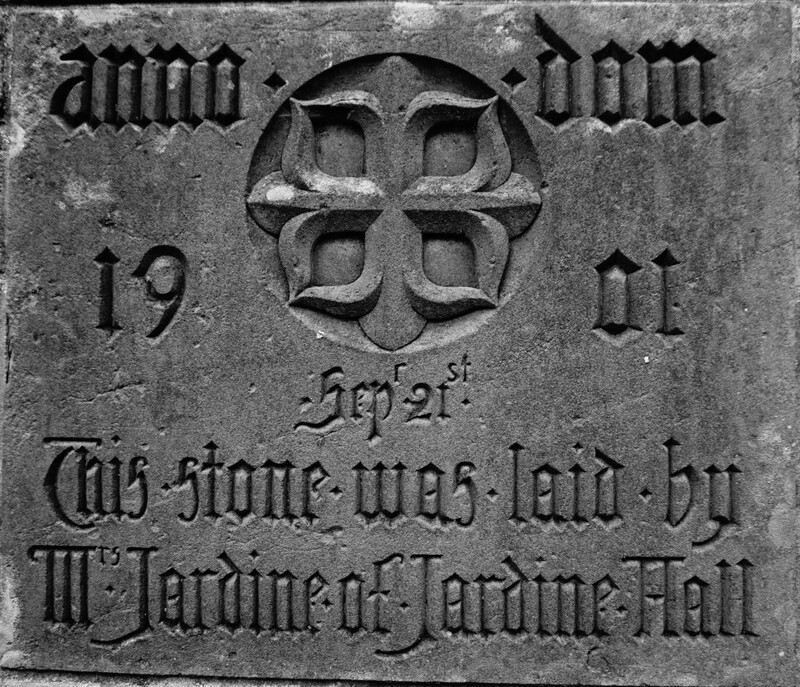 The foundation stone, which may be seen outside the church in the East wall, was laid by Mrs. Jardine of Jardine Hall on September 21st 1901. At the West end of the church, to your left as you enter, is a belfry, housing just the one bell. 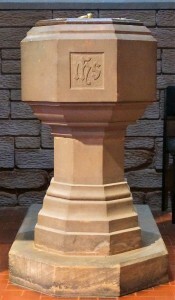 Below the belfry is a simple stone font with a wooden lid decorated with brass. Behind the font is the baptistery window, the church’s oldest window, depicting four angels adoring the Blessed Sacrament. 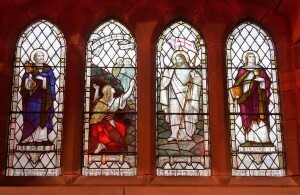 Records from 1891 show that this window was promised to the first All Saints Church, in the Townhead Chapel by Mr. A. H. Johnstone-Douglas in memory of his mother, Lady Jane Johnstone-Douglas and his father and sister. In 1905 it was transferred to the new building, where you see it today. Unfortunately we do not know who designed it. 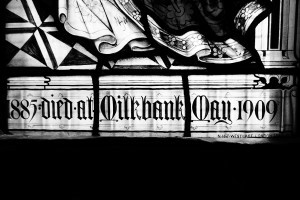 Moving on round the church we see the North wall window which commemorates Major William Bell Macdonald of Rammerscales who died in 1923. 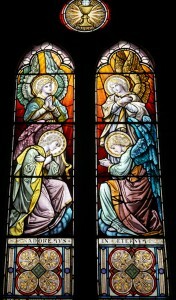 The subjects shown are Saint Peter, Mary Magdalene meeting Christ outside the empty tomb and St John the Evangelist. The window was produced by the company founded b the famous designer William Morris. The organ pipes behind the pulpit were restored by the Reverend Arthur Baker. 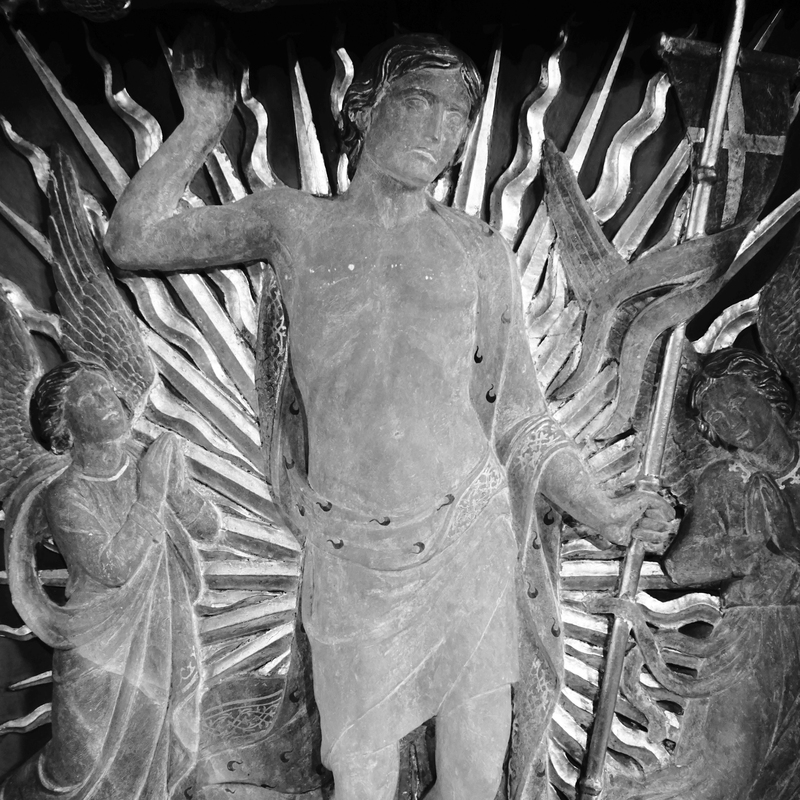 However after his death it was decided that it would be too expensive to maintain the organ so the pipes were retained as a memorial to his devotion. 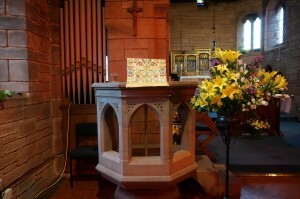 Today an electronic organ, given by Mrs Kim Byers, is used to accompany services. High on the East wall of the chancel, in the apse above the altar, is a small stained glass window depicting the Risen Christ. Unfortunately we do not know who designed it. Altar and Reredos Dominating the East end of the chancel is a beautiful marble altar. 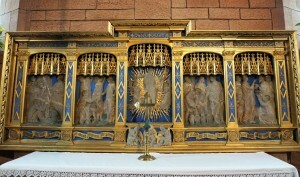 Resting on it is the delicate, altarpiece or reredos, created in 1925 by Sir J Ninian Comper (1864 – 1960). Born in Aberdeen, he was a famous architect who travelled widely on the continent and was influenced by Late Gothic architectural styles, church decoration and furnishings. The blue and gold painted wooden panels inspired by the Italian renaissance, frame the alabaster reliefs of white figures on an azure blue ground. The two panels on the left represent Moses striking the rock to bring forth water, ad Moses at the well of Midian giving water to the daughters of Jethro. The central panel portrays the risen Christ flanked by two angels and below him are three soldiers set to guard his tomb. The two panels, on the right depict two of Christ’s miracles, the wedding at Cana, showing Christ turning the water into wine and the feeding of the five thousand. 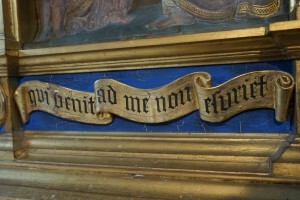 The reredos is dedicated to David Jardine Jardine and his wife Mary Angela who were churchwardens from 1903 – 1924. The embroidered kneeler, on the altar step, commemorating the Lockerbie Air Disaster, was made by Lansdale Daley, an American actress, sister to Rev Alexander Daley who had visited all Saints on an exchange with Rev Alan Neil. Above the vestry door is a brass plaque listing those members of the congregation who died in the First World War. 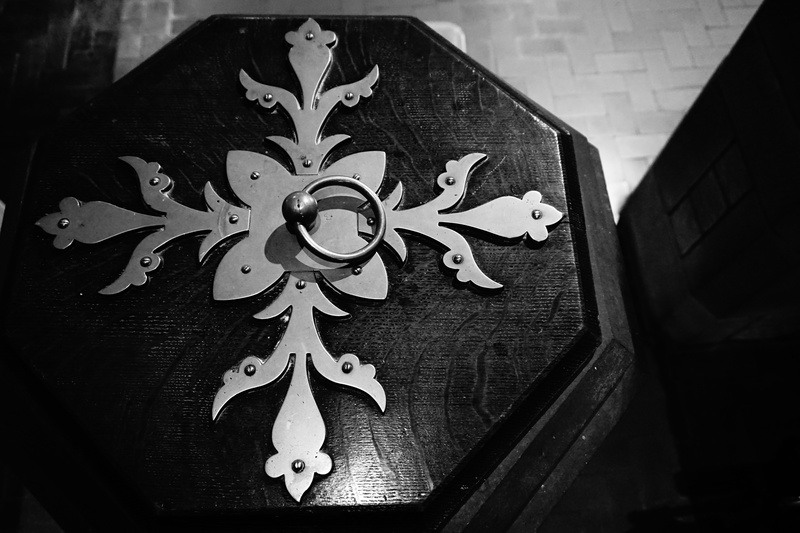 No such losses in the Second World War are recorded in the church. On the South wall are two striking, stained glass windows. The first is the Ronald James Jardine memorial window also designed by Sir J Ninian Comper, who ‘signed’ his work by including a tiny, green strawberry plant, to be found in the bottom right hand corner. His father, a Scottish minister, was collecting strawberries at the time of his death. 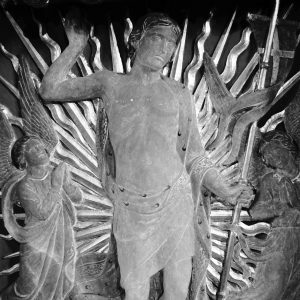 The first panel depicts Saint James the Less carrying a club – the symbol of his martyrdom. As he was clubbed to death. Above him is the crest of Eton College. The centre panel is of Christ bearing his cross ad emblems of the crucifixion (clockwise from right) the nails, the dice, the flails, the purse and thirty pieces of silver and the spear. At the top of this panels the badge of the royal flying Corps. The third panel shows the young officer himself, with his family coat of arms below the badge of his regiment, the Royal Scots Greys. It is poignant to read in church records that ‘Master’ Ronald Jardine accompanied his mother at the ceremony of the laying of the foundation stone of all Saints; just 16 years before his death in the First World War. Comper may also have been responsible for designing the revolving wooden lectern, also a Jardine memorial, which stands in front of the window. 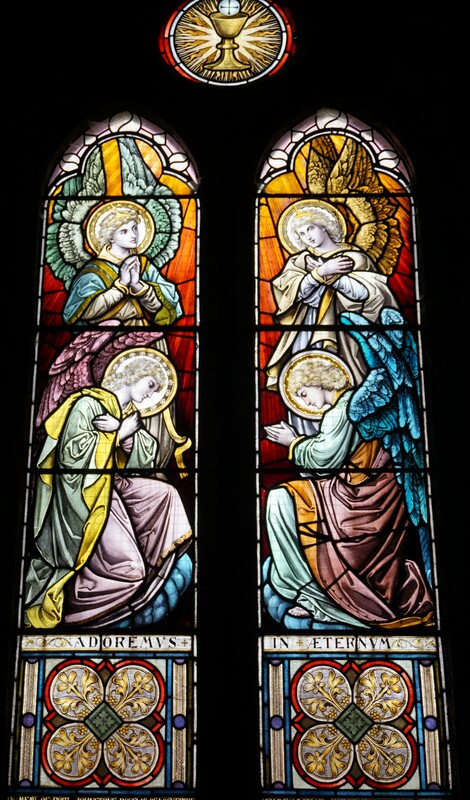 The second window, on the south wall, next to the entrance, depicts the Annunciation, with the figures of the Virgin Mary and the Angel Gabriel on either side of a vase of lilies. It commemorates Mary Louise Bell-Irving, who died on May 9th 1909, and was designed by Nathaniel Hubert John Westlake FSA (1833-1921) a 19th-century British artist who specialised in stained glass.